Died: May 20, 2010 in Operation Iraqi Freedom. Spc. 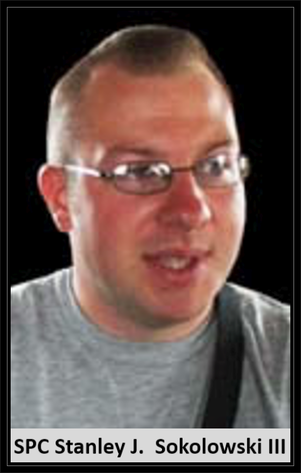 Stanley J. Sokolowski, III, 26, of Ocean, N.J. died May 20 in Kirkuk, Iraq, in a non-combat related incident. He was assigned to Special Troops Battalion, 1st Brigade, 1st Armored Division, Fort Bliss, Texas. Stanley is survived by his parents, Stanley and Christie Sokolowski; his brother, Todd Gregory, his wife, Nadia, and their sons, Dillon and Jacob; his sister, Shannon Saenz and her children, Natalya and Dominic; his sister, Katie Sokolowski; brother, Kyle Sokolowski; maternal grandparents, Warren and Elizabeth Stickney, and numerous aunts, uncles and cousins. A special son, brother, and uncle, Stanley's love for his niece and nephews and zest for life will sorely be missed by his family and friends. OCEAN TOWNSHIP — When he was just 16 years old, Stanley J. Sokolowski III was working as a volunteer for a local first aid company. He went on a call for an elderly woman and was saddened to find she had passed away. "He cut her obituary out of the paper and carried it in his shirt pocket for months," recalled his mother, Christie Sokolowski. "That was the kind of kid he was." Army Spc. Sokolowski, an Ocean Township resident, died of injuries sustained in a non-combat related incident in Kirkuk, Iraq on Thursday. He was 26. Today, hours after the news of his death was made public by the Department of Defense, the Army soldier and former volunteer fireman was being remembered as someone who simply wanted to help people in need. "He was a very quiet kid who was loyal to the firehouse," said Steve Pejakovich, captain of the Atlantic Engine and Truck Company No. 2 in Long Branch, where Sokolowski volunteered. "He was one of the most reliable drivers we had. We’re all saddened and upset by what has happened." He is at least the 97th service member with ties to New Jersey to die in Iraq since 2003. Sokolowski graduated Ocean Township High School in 2002. He had volunteered for different fire and first aid squads in Long Branch, West Long Branch and Oakhurst. He also worked as a lifeguard in several area pools and briefly at the Red Bank Veterinary Hospital. In 2006, he worked in Iraq as a civilian contractor for Wackenhut Services Incorporated, which provides security, emergency response and fire protection for the military. Christie Sokolowski said her son joined the Army in August, 2007, to better his chances of becoming a full-time firefighter upon completion of his duties. He was assigned to Special Troops Battalion, 1st Brigade, 1st Armored Division, Fort Bliss, Texas. Sokolowski worked in Army intelligence, his mother said. He was scheduled to come back from his current tour in November. "As a veteran, he thought would give him a better shot of being hired as a firefighter," Sokolowski said. "He always informed us that what he was doing was not dangerous. I have e-mails saying ‘Don’t worry, this is very safe." "I remember the day he told me signed up for the Army and I couldn’t believe it," Pejakovich added. "But he wanted to be a paid firefighter and from what I heard he was doing good." Sokolowski loved reading books on Teddy Roosevelt and took up archery as a hobby. Solomon Hicks, an assistant captain at Atlantic Engine and Truck Company No. 2 , described Sokolowski as someone who "loved his music" and also took a certain amount of ribbing for being a vegan. "He was a good fireman and a good friend," Hicks said. The Pentagon, Fort Bliss and Fort Dix provided no further information regarding the nature of the incident that led to Sokolowski’s death. His mother also declined to comment on the cause of death, but said there would be an investigation. Sokolowski is survived by his mother and father Stanley Sokolowski II of Ocean, brothers Todd Gregory of Farmingdale and Kyle Sokolowski of Daytona Beach, Fla., sisters Shannon Saenz of Wall and Katie Sokolowski of Ocean. On a notebook on her kitchen counter, Christie Sokolowski penned words and phrases written to describe her son, including: "he was a humanitarian and someone who always fought for justice" and "someone you could always count on." Verbally, she echoed the loss. "He trusted everybody," Sokolowski said. "He took everybody at their word."